Our unique formulations and NSF Sport certified products are addressing the very demanding needs of the world’s most elite athletes. MEND™ announced today that it will immediately begin working with NFL prospects Kolton Miller, Adam Brenneman and Chase Edmonds to provide these athletes access to award winning MEND functional nutrition products and nutrition advisory program during their preparation for the 2018 NFL draft. As a part of the new partnership, MEND will immediately begin to work with three former collegiate athletes who are top prospects for the upcoming NFL draft. The MEND science team will develop a custom nutrition program strategy for these athletes and film their preparation for the NFL draft which takes place in Dallas April 26-28. The highly specialized MEND nutrition advisory program focuses on optimizing healing and recovery and promoting peak sports performance. 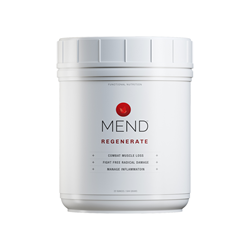 MEND, is a leading provider of functional and medical nutrition products that have won numerous awards and accolades and have been adopted by the most demanding clients in medicine and professional/collegiate sports. The unique evidence-based formulations have garnered industry praise and rapid adoption from multiple sports, leagues and Olympic athletes. A 6-foot-8, 310-pound left tackle, Kolton is one of the top prospects in the 2018 NFL Draft. Playing in every game this season for UCLA, Kolton was named second team all PAC-12 during the 2017 season. Chase just completed a record-setting career at Fordham where he set Patriot League and school marks in rushing yards and rushing touchdowns. He closed out his career with 5,862 career rushing yards along with 74 career touchdowns and 67 career rushing touchdown, all school and Patriot League records. His 5,862 career rushing yards is fifth best in NCAA FCS history. Follow Chase on Twitter and Instagram: @ChaseEdmonds22. At Octagon we inspire brands, talent, and our people to see the world for all its potential. Then, we help our clients pick the right opportunity to make the next right move. We are a passionate team of 800 savvy veterans and bold upstarts, relentlessly committed to helping our clients and our teammates push forward. What’s Your Move? See more at Octagon.com and join us @Octagon.